1. Heat 2 cups of water in a large, broad vessel over medium flame. 3. Add the rice and cook till soft. 4. 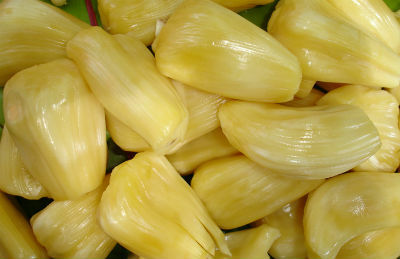 In a small frying pan, heat 2 tsp ghee and fry the jack fruit pieces. 5. Add the jackfruit, sugar, cardamom powder and sugar to the rice. 6. Mix well and reduce flame. 7. Cook till the pongal is thick and creamy. 8. Remove the pongal from flame and mix the yellow food colour. 10. Just before serving, pour a little ghee on top and serve hot. Feel free to comment or share your thoughts on this Jackfruit Pongal Recipe from Awesome Cuisine.